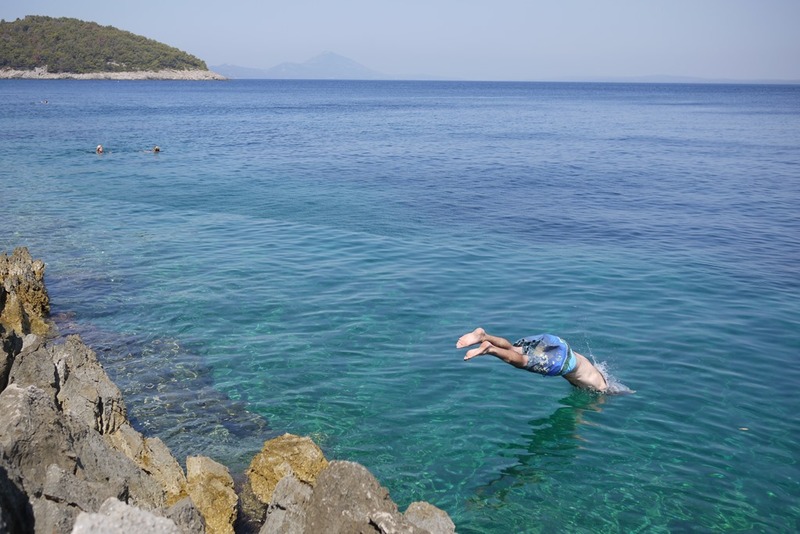 Finding myself floating in tepid jade sea off Lošinj, Croatia’s self-dubbed “island of vitality”, was a bit of a surprise. We had always planned to spend time relaxing in the northern islands of Croatia’s Adriatic Sea, but with every blog post and travel guide read about Croatia’s glorious island options, we felt more spoilt for choice and hesitant to commit to any one place. A decision was forced on our final night in Pula, when our island-hungry party of three bought tickets on the first ferry out in the morning, which was bound for the mainland city of Zadar and stopping at the town of Mail Lošinj, on the the large island of Lošinj. Being pretty much the only Croatian island I hadn’t read about, I knew nothing other than that our ticket vendor thought it was “very beautiful” with “good beaches” and “many restaurants”. All good things. Arriving on the sleek catamaran without any booked accommodation or exit strategy was far less daunting than expected. The calm island port graced our eyes with white and terracotta tones, luxury yachts and waterside al fresco dining, prompting my sister to declare it was the “prettiest port” she’d seen. Good, excellent, so far so good. One of the things I love most about travelling in Croatia is being able to find a room without a booking. Private rooms and apartments are common throughout the country and marked with blue ‘Sobe’ (bed) or ‘Apartman’ (apartment) signs. Local tourism offices also keep a register of local rooms and apartments for rent and can arrange your stay with a quick phone call. Within minutes of asking, we were being lead at a blistering pace through narrow lanes by a tourist office employee, on our way to view an available triple room. The creaky gate was opened by a shirtless, grey-chested man wearing earphones around his neck. He ushered us in with a generous smile, through the busy courtyard, before showing us a room occupied by two sleeping girls while declaring “it’s okay, it’s okay, we won’t wake them”. No thanks. Coffees long since consumed and still none the wiser about what exactly was going on, we made the decision to just go with it. The jeweller, who was very hard to understand but very warm and eager, seemed to be doing her best to find us a place. About 45 minutes later, after many reassurances of “soon, soon”, a man in hatchback pulled up and the jeweller explained, through another cafe-goer, that he would take us to a hostel “up the hill” and “near the beach” to look at a room. Sure, why not? The room was perfect: cheap, air-conditioned, clean, near the beach and town, managed by a very friendly bikini-wearing lady. With our beds happily secured, it was time to explore the other unexpected delights on the island. The delights were so surprisingly impressive that we extended our stay to four nights in total, which, we later admitted, was still far too little time on the island. We spent our days cycling the wide path that follows the island shore, diving from rocky shelves above the crystal blue sea, eating fresh seafood with carafes of wine and reading, napping, walking, swimming. To my heart-warming pleasure, I found that joyful hours could pass while just floating (one of my favourite things to do) as fish wiggled in the visible depths below and the sun smiled brightly above. The effortless drift of one day into the next was marked by a cool Adriatic breeze and a pink-golden glow on the seaward horizon. 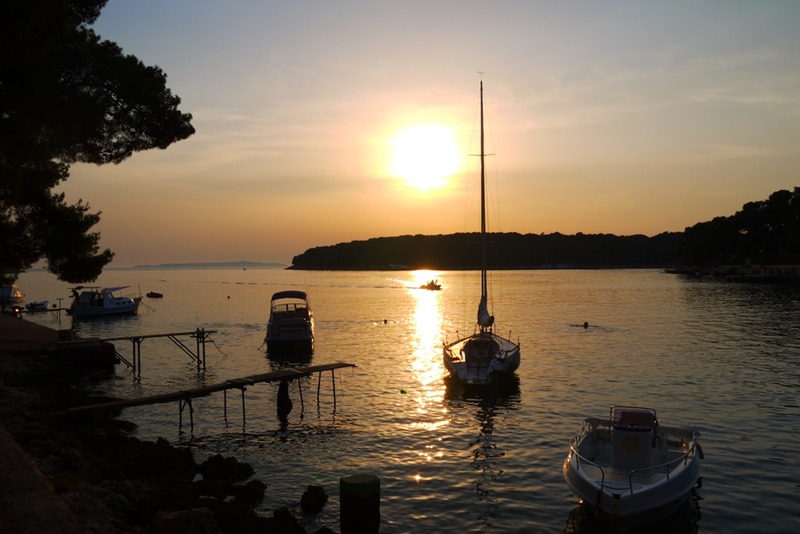 Each day we discovered a new seaside cove, another dusk-quiet marina, another shady tree to settled under, and by the time we departed on our Zadar-destined catamaran, we were sun-kissed travellers, revitalised by island time and a little sad to leave. It seemed that most of the tourists in Mali Lošinj were Italians who had sailed across the Adriatic and moored in one of marinas. The result was a lot of Italian spoken by islanders, lots of trading done in Euros (wise to have some on hand) and lots of gelato and pasta. Catamarans to and from Pula are not daily all year around, so check the timetables before you book. Also, be sure to buy your ticket the day before you depart from one of the tourists offices. Other ways on and off the island can be found via smaller ferries that island hop, and other catamaran services to other mainland hubs, such as Rijeka in the north (between Istria and Zagreb). 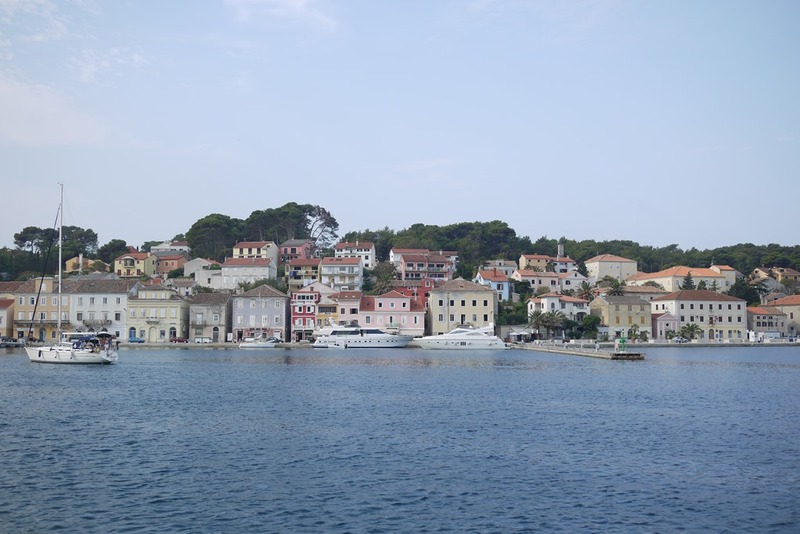 The smaller port town of Veli Lošinj is worth a visit. 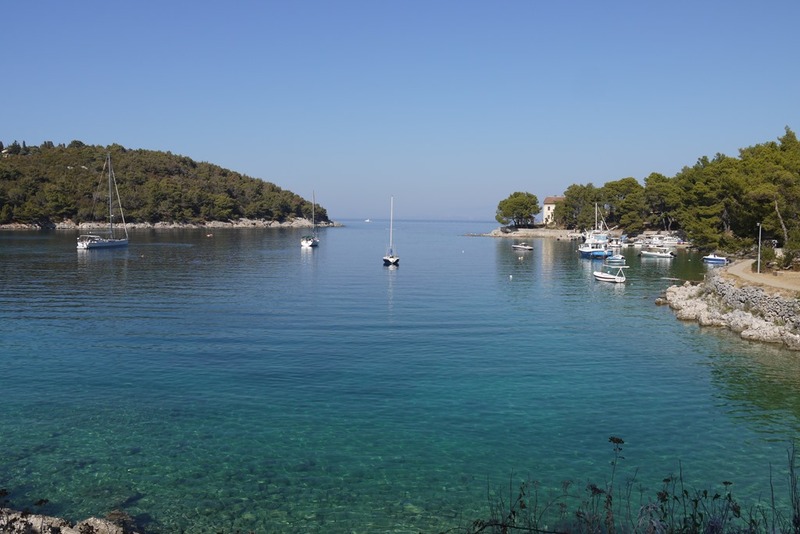 We hired bicycles from a portside tourism office in Mali Lošinj (60-95 Kunas for 24 hours, depending on the office) and rode to Veli Lošinj for lunch (about 30 minutes of solid cycling along the coastal track or many hours if swimming along the way). From Mali Lošinj we took the main road through the middle of town, up the hill, past all the ATMs (good to know) and then turned right along the seaside track. There are quiet little beaches along the way. For a lovely string of sandy beaches and a good running track, head towards Čikat. From the western edge of the port in Mali Lošinj, squiggle up the hill, through the houses, then cross the road and take one of the many little walking tracks that leads down to the sea. For a jog, I suggest turning left once you reach the shore and for sandy beaches, bars, watercraft hire and more people, turn right. 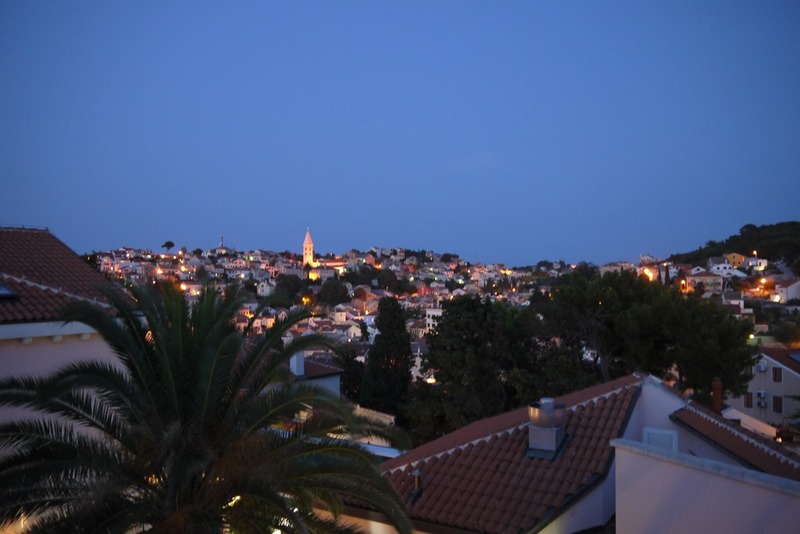 Things cost a little more in Mali Lošinj but are still pretty cheap. 1 hour of windsurfing costs about 60 Kunas, a little boat for the day starts from €140, a glass of wine is 6-9 Kunas, espresso (a.k.a. kava) is the same, beer is 10-20 Kunas and the catamaran from Pula to Mali Lošinj and Mali Lošinj to Zadar is a very reasonable 50 Kunas. Ask the tourism board what is on in town over summer. Like most of Croatia, summer is synonymous with events season, meaning there are performances on in public spaces most nights. We had the pleasure of seeing the free Balcony Festival, which offered operatic performances from residential balconies that fronted the main town square. your search for accommodation make me LOL… this is how things are done in Croatia, showing you a room with someone sleeping in it, perfect!! Thanks for reading and commenting. Yes, I love the Croatian approach to life, and this was not my first trip of happy bed hunting in Croatia. I was mostly concerned that the girls weren’t allowed any privacy as we were pulled into the room… they were sprawled across the bed in underwear (a state I’d rather not be found in if the roles were reversed). That said, we LOLd too. Glad to share my bed hunting adventures – for me that morning sums up so much I enjoyed about Croatia. I never knew I wanted to go to Croatia until I read this post! Sounds like a lovely island! 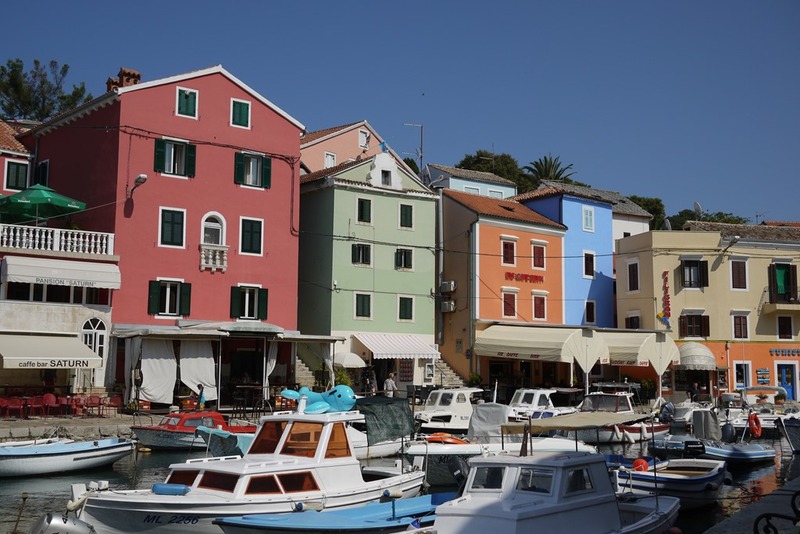 Oh Losinj is just the start Mercerlm! Croatia remains one of my favourite countries in all my travels. 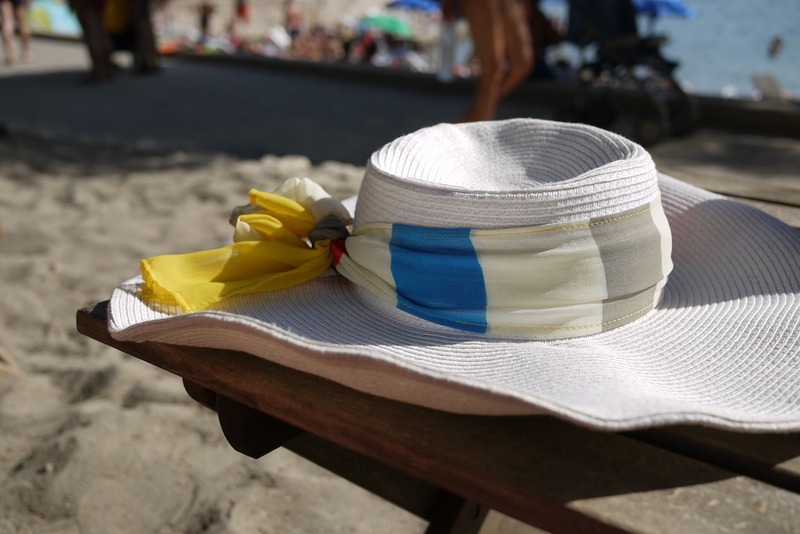 Next up I’m writing about my sunny adventures on the island of Pag, which are equally as happy. Looks pretty idyllic for recharging batteries. Very much so Jo, especially as I believe I’m sun-powered. Oh, I wish I would have made it there when we were in Croatia this summer. I was, however, really taken with Pula (which I wasn’t expecting at all). I find there is always somewhere that I missed on a trip that sounds amazing… there are always more places to add to the list. Glad you were taken with Pula though. I enjoyed my stay there too, probably moreso because I knew little about it before I arrived. I really want to visit Croatia and you post has made we want to visit even more 🙂 Beautiful pics too. Thanks for reading and commenting. I appreciate your lovely feedback. Stay tuned for more of my Croatia adventures. I’ve also got post from my 2010 visit in my archive if you’re interested. Last time I went to Zagreb, Dubrovnik, Split and some of the southern islands. I can’t agree with your post enough. It makes me want to go back to Croatia! The people really are incredibly nice and drinking and eating in the area is just comfortable! i have been visiting Croatia many times when i was a kid. you just made me wanna go there again 😉 love it!